Mystery Fanfare: KENTUCKY DERBY CRIME FICTION & MORE! 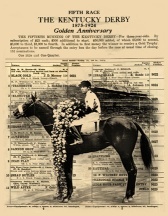 The 141st Kentucky Derby takes place today. To celebrate, I've dusted off last year's list of Kentucky Derby mysteries and added a few more titles. You'll want to read some horse-racing mysteries to get in the mood and enjoy the day -- or watch the movie The Kentucky Derby (1922). It's full of grit and crime. Have a piece of Derby Pie (recipes on DyingforChocolate.com), filled with chocolate, bourbon and pecans-- and, since it's also National Truffles Day, make some Mint Julep Truffles or Kentucky Derby Bourbon Truffles. 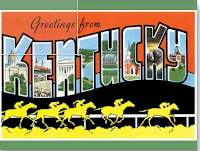 Planning on attending the Kentucky Derby this year? Don't forget your hat: "Crowning Glory: The Art of Kentucky Derby Hats"
Low Down and Derby, a collection of fast paced mystery stories set around the Kentucky Derby, by fifteen authors from the Ohio River Valley Chapter of Sisters in Crime, edited by Abigail Jones. My Cruel Cuts is about an insurance scam involving race horses. Not as much mystery as general shady doings, but Damon Runyon certainly deserves a place here! Thanks for mentioning Low Down and Derby. I don't believe Silver Dagger is active any more. You can still get it used on Amazon, though. I'd like to think people could still enjoy our stories.